Champion at Westport in 2008, the Portmarnock man ended the day where he started, three shots clear of the chasing pack, after a third round 71 gave him a four over total of 214. A two-time East of Ireland and South of Ireland champion, Morrow made a poor start to his final round with bogeys at the first, fifth and seventh against a solitary birdie at the sixth. 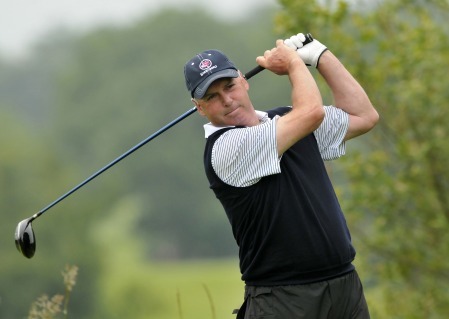 Picure by Pat CashmanAnd while a birdie on the tenth was cancelled out by a bogey on the 12th, he picked up a shot at the 17th to seal a three-shot win over playing partner Ian Brotherston of Scotland. Killeen’s Maurice Kelly won the Over 60’s trophy, Scot James Kinloch the Over 65’s and Waterford’s Gerry O’Keeffe the Over 70’s. Tramore’s Rory Fitzgerald carded the best round of the day with a two under par 68.